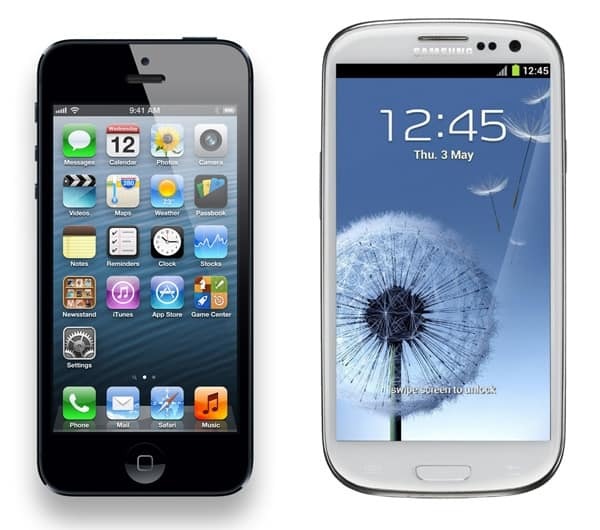 With the long awaited launch of the new iPhone5 having a larger screen and an improved performance, we find it mandatory to make a comparison with the Samsung rival the Galaxy S3 and give a final verdict of which one is the better Smartphone. The iPhone5 was available for sale starting with the 21st September and recorded amazing numbers in sales. In the first day the sales reached 2 million in order to reach the amazing number of 5 million in two more days. The iPhone 5 is expected to sell over 26 million units by the end of the year. The galaxy S3 on the other hand, totaled 10 million in sales in the month of July, very good compared to the older versions of the Galaxy series and the expectations for the end of the year are around 30 million units in sales. We will compare the two phones after three main categories: Appearance, Screen and Hardware and in the end we will give the final result. One of the impressive features of the new Apple phone is the extra thickness. They managed to compress everything to a thickness of only 7.6 mm by removing the real layer of glass, switching to nano-SIM etc. This result is very impressive compared to the design of the S3 which is actually thicker with 1 mm, totaling 8.6 mm in thickness. The predecessor iPhones were not so comfortable in hand, so the new iPhone 5 edges are more rounded than before and this makes it feel more comfortable while holding it. The dramatic change is represented by the graved aluminum back case that is a lot less slippery and extremely resistant. The aluminum back also has a downside. Actually it is a downside for the black version, because aluminum is not resistant to scratches, so if you do scratch it, the black case will reveal the aluminum beneath it and this may ruin the appearance. You can avoid this by simply purchasing the white version. In terms of numbers, the S3 has a huge screen, measuring 4.8 inches and a 58mm width, a lot larger than the 58 mm iPhone screen. Regarding comfort while holding it, we can say that the fact that is so big makes it a little too difficult for some to hold it and this takes some points out of comfort. Apple is known for the innovating designs of its gadgets, and this time, we thought that the changes they made to the headphones worth being described. The new “Earpods” are made of plastic and have an all new innovating design, which gives a nice listening experience to all users. The main characteristics of the Earpods are the fact that they fit inside the ear very comfortably, they leak almost no outside noise and the sound experience is also great. The technology boosts the bass and mids very nice. The second changed accessory is the power cable. It’s not the old one any more, with its 30 pins. The new one features an 8 pin socket that seems to bring some advantages. Samsung maintains it simplicity but keeps efficiency. It uses a micro USB power cable and the IEM headphones are very good at isolating sounds, but the sound experience isn’t the best, we can say. At a last we reach the big change featured by the new iPhone 5, the long awaited change in the size of the screen. This is the first time in 5 years when the iPhone has other dimensions in the screen size. We are talking about a 4 inch display screen with a resolution of 1,136 x 640 pixels. The phone is no wider, only longer with a larger resolution. This will help with movie watching for sure. One problem caused by the change in the screen size is the fact that apps have to be modified to fit in the new screen, the ones that are not modified simply use the older measures and leave a blank space at the bottom of the phone. The screen technology is called IPS and has been used in the past also. With the Galaxy S3 you only get big. We are talking about a huge 4.8 inches display screen spread across a width of 7.6 mm and a resolution of 720 x 1,280, very impressive numbers we can say. The thing is that the width of the screen may appear too large for some hands. The screen technology sis the Super AMOLED display used in other Samsung models also. It seems that the IPS technology used by the iPhone give just a more natural appearance and this can be considered a plus. The AMOLED screen works best if the phone is in a dark room, because when it’s placed into sunlight it works fine but it cannot compare with the iPhone screen which gives amazing visibility and increased brightness. The two big operating systems Android and iOS are in continuous battle. Still, from the two operating systems the only one that seems to advance with serious speed is the Android now featuring the latest version Android 4.1 Jelly Bean. The Samsung Galaxy S3 started with the Android 4.0 version so many models may still be out of date. The iOS 6 still seems to work better than the Android 4.1 but they are making very good advances with the new Jelly Bean and Project Butter initiative that should allow a running speed of 60 fps from the processor. With all these, Android wins when it comes to personalization and flexibility. It gives the option to personalize everything starting with the home screen, apps, third party apps, and pretty much everything you want. The iOS is really stiff and pretty much basic. You cannot modify anything and you cannot install third party applications that can modify several functions. In the new iOS 6, Apple decided to give up Google maps and use their own maps application. This was the reason of incredibly many complaints from users because the maps that Apple uses are out of date and don’t cover all streets and areas. The Google maps, successfully used by Android users are extremely efficient and as a matter a fact are actually updated. The innovation in Samsung phones stands in the NFC pairing technology, the eye movement monitor for controlling the backlight and the TouchWix UI. It uses a 4 core processor of 1.4 GHz called Exynos 4412 that might just beat the iPhone processor. The iPhone processor seems to be twice as faster than the previous model but more details aren’t available since they were not revealed by Apple yet. As we got used from previous iPhones, it only comes with the internal memory as no memory slot can be added. Regarding media content that can be added to the phone the iPhone is practically based only on iTunes for media transfer. Much better than the iPhone, the S3 allows a micro SD card for extended memory. To transfer media files you just need a micro USB cable and use the phone as flash drive. You can transfer anything on the phone. The S3 also has an output that allows you to connect it to an HDMI port and play HD videos and sounds on a HDMI compatible device. The camera on the iPhone 5 is almost similar to the one on the iPhone 4S using the same 8 megapixel sensor, the same LED flash and so on. The extra feature is the panoramic mode that allows you to make panoramic pictures of up to 28 megapixels with the new improvements. This is a lot better than other panorama modes. It features a camera of 8 megapixels also and an LED flash. Among this it also features 1080p video capture and other focus options. Compared to the iPhone 5 camera, we can say that it’s slightly beneath it. It has a battery of 1440mAh almost the same as the 4S. It gives a talking time of up to 8 hours including 3G and 40 hours in audio playback. You still cannot take out the battery from an iPhone as we got used from the past. The Galaxy S3 is from far the winner in terms of battery power featuring a 2100mAh battery. We have compared the iPhone 5 and the Galaxy S3 and what we can say about the iPhone is that with the new larger screen and aluminum case it just feels like a winning device, very comfortable and very slick, compared to the fragile touch of the S3. The battle between the two is continued with the battle between Android and iOS and it seems that the Google operating systems is coming really close to its primary rival.